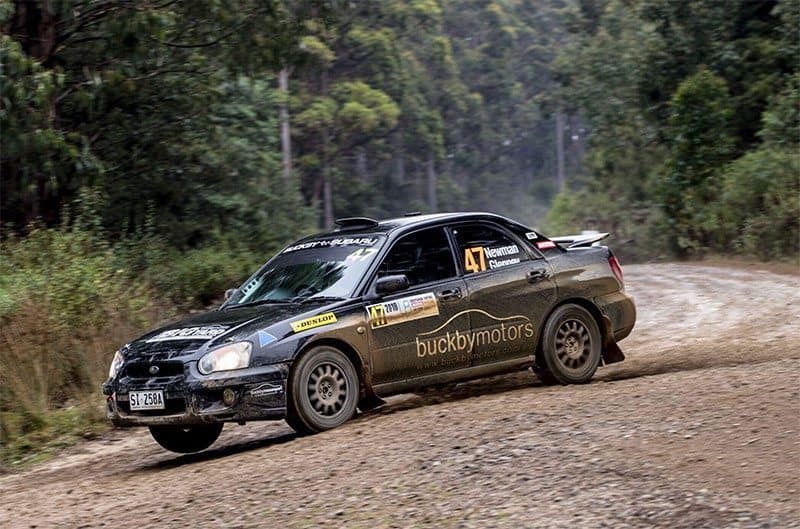 The Buckby Subaru Challenge revved into life at Round 1 of the Dunlop – Motul Tasmanian Rally Championship, The Lifestyle Builders Southern Safari Rally with teams undertaking reconnaissance of the course on the Friday. Teams were allowed two passes over each stage to tidy notes in preparation for the event proper. On Saturday morning teams awoke to showers, but the weather didn’t dull the excitement to be back behind the wheel. Nic Grave with last minute fill in co-driver Gareth Sutcliffe and Ben Newman with Steve Glenney beside him continued on from where they finished off last season, separated by just over two seconds after the first stage in Grave favour. The dark horse crew of Pete Nunn and Keith Johnstone surprised everyone, jumping out of the box early and taking a further 4 seconds out of Grave time. The team of Scott Newman/Tim Kulhanek driving the Buckby Guest car drove consistently to finish heat 1 in 3rd place, behind Newman and Grave respectively. After 8 stages only 3.4 seconds separating the two. Elliot Ritchie/Doug Austin improved their pace, posting consistent stage times until a minor off left him stranded (but luckily undamaged) mid stage. Pete Nunn was the most unlucky, putting his car on its side at the spectator point on Special Stage 8. They were able to put the car back on its wheels and limp to the end, but the damage was done. Crichton Lewis/Anthony Carr suffered fuel issues early in the day and retired from Heat 1 with a split fuel line. He was able to limp back to service to repair and restart Heat 2. The teams of Troy Johnson/Bec Sheldrick, Bill Fulton/Jase Milner and new comer to the series John Lakeland with John McIndoe beside him rounded out the leader board. Heat 2 only consisted of two stages, a repeat of Special Stage 1 Lovetts and the final being a 22Km combination of the Old Hastings and Creekton stage. Once again Ben Newman set the benchmark, setting a time of 7 mins 14.6 Seconds, with Grave just 1.8 seconds behind and Nunn a further 10 seconds behind after replacing the rear suspension from the earlier altercation. Scott Newman and Crichton Lewis were the best of the rest a further 9 and 11.5 seconds back respectively. Going into the final stage, just 5.2 seconds separated Ben Newman and Nic Grave with Newman having the upper hand. Once again it was Newman who dominated the stage taking another 11.7 seconds out of Grave. Pete Nunn, Scott Newman and Crichton Lewis rounded out the Top 5 for the heat. Ben Newman convincingly takes out the first round of the 2018 Buckby Subaru Challenge, Nic Grave in second place and Scott Newman in his first foray into the world of Subaru All-Wheel-Drive, rounds out the podium in third. Round 2 of the Buckby Subaru Challenge moves to Smithton in the North West of the State on the 12th of May. The Buckby Subaru Challenge is a one make series based on the 2001-2005 Subaru Impreza RS 2.5i. It is a perfect entry level vehicle for those considering the world of Gravel Rallying. The rules enable safe, cost-effective racing on an even platform. A ready to rally car can be purchased for under $20,000 with parts easily accessible and affordable.